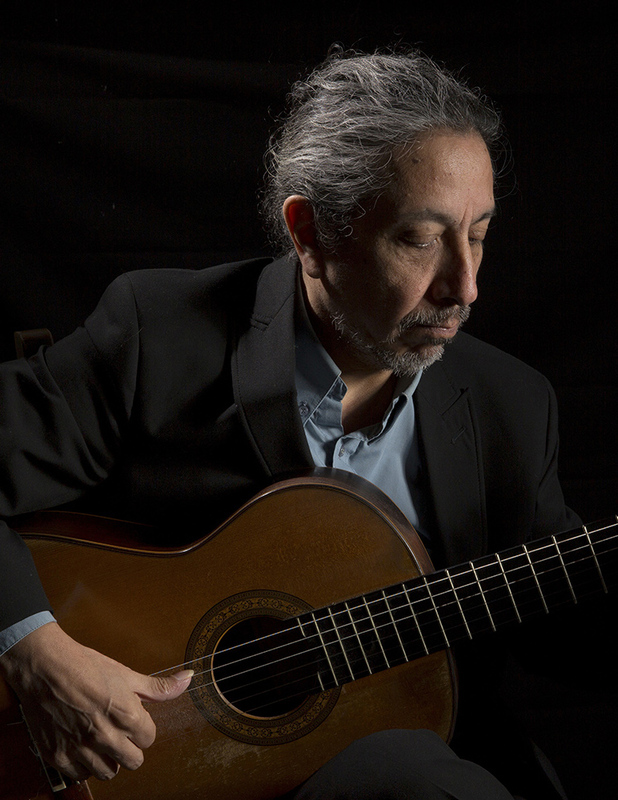 Patricio Cadena Pérez started playing classical guitar in Ecuador, his homeland, when he was 21, as a self-taught musician. A few years later he joined France to learn musical reading and analysis at the Paris Conservatory by taking composition courses. He also learned how to perform from the Argentinian concert artist Roberto Aussel, the Uruguay master Carlevaro and the British lute player Terence Waterhouse. His own research lead him to develop his own technique of playing the instrument. A trained composer, he entered for IRCAM (Institut de Recherche et Coordination Acoustique/Musique) in Paris, EMS (Electroacoustic Music in Sweden) in Stockholm and attended Pierre Boulez' courses at the Collège de France. Patricio Cadena Pérez was a prematurely geek competent at computer music. He set up a recording studio in Paris where he would meet many artists and performers such as Argentinian guitarists Juan Falu, Ricardo Moyano, Norberto Pereira and Pablo Marquez, stage director Oscar Sisto, and the French saxophone player François Jeanneau. He is a multi-faceted artist with a rich and dense repertoire, who can perform baroque and classical as well as contemporary music. He is also an expert at latin American traditions such as malambo, chacarera, tango, candombe from Argentina; waltz and marinera from Peru; bossa, choro and choriño from Brazil; or pasillo, yumbo, sanjuanito and albazo from Ecuador. In addition he can sing a large cycle of Latin American popular folk songs. His most recent CD is untitled Musica Urbana de América Latina. As a soloist, in duos or trios and with groups mixing latin folklore and contemporary pieces, Patricio played in France at the salle Gaveau, the Palais de Tokyo, the Café de la Danse; in the UK at the Hall Bolivar House in London and the Dance House in Manchester; in Austria at the Casa Latina and the Vienna Diplomatic Academy; and in Germany, Sweden, Turkey, India, Argentina, Bolivia and Ecuador. Reccntly he was invited to play his compositions at the Paris Sorbonne amphitheater on the occasion of a magisterial lecture by Mr. Rafael Correa, the Ecuador president. His compositions range from popular music to electroacoustics and match with dance as with The Ecuador Dance National Company, or with documentary films such as " Tranvestites Also Cry " which got several international awards.